Imagination, creativity, and family expression are the essences of our unique Designer Rods®. When it comes to your home, you know exactly what you want, and real beauty is found in the accents and details of your home. Our distinctive approach to bathroom fashion allows you to set the mood. Whether your style is traditional, contemporary, urban or eclectic, we have exclusive, one-of-a-kind, design elements that accentuate your family's persona. The beach means to us the big blue sky, sunshine, quality time with family and friends, fresh air, smiles and beach glass. Beach glass is special and unique just like our Designer Rods®. No two rods are the same. Each functional designer rod is a piece of art for your home. 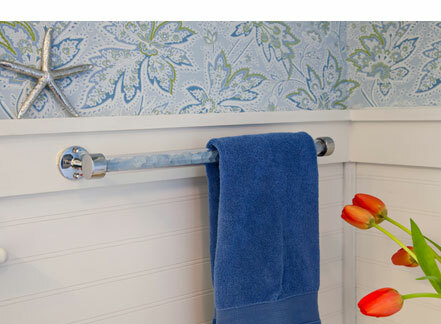 Designer Rods, featured on HGTV's Kitchens and Baths 2008 Special Presentation.